Department of Labor War Emergency Employment Service U.S. Public Service Reserve Des Moines, Iowa H.J. Metcalf, Federal State Director June 24, 1918 Mrs. Francis E. Whitley Chairman Woman's Committee Council National Defense, Webster City, Iowa. 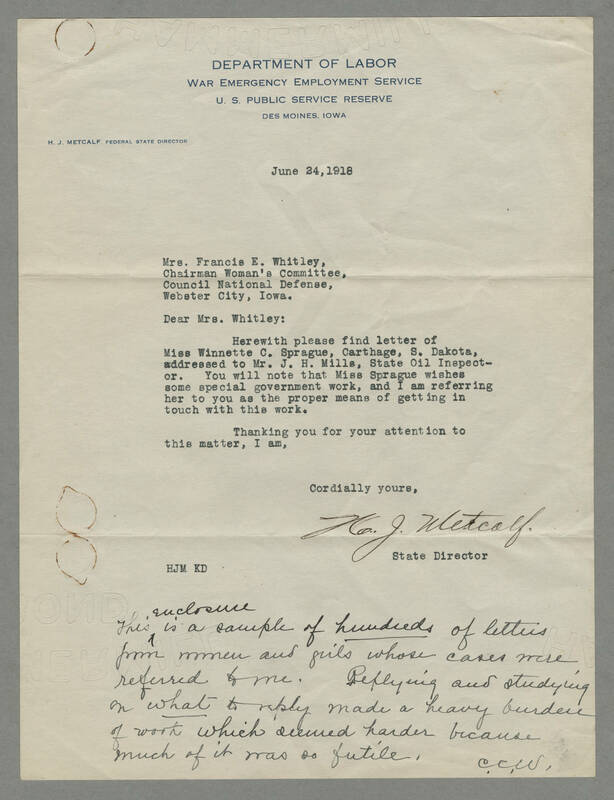 Dear Mrs. Whitley: Herewith please find letter of Miss. Winnette C. Sprague, Carthage, S. Dakota, addressed to Mr. J.H. Mills, State Oil Inspector. You will note that Miss Sprague wishes some special government work, and I am referring her to you as the proper means of getting in touch with this work. Thanking you for your attention to this matter, I am, Cordially yours, H.J. Metcalf State Director HJM KD This enclosure is a sample of hundreds of letters from women and girls whose cases were referred to me. Replying and studying on what to reply made a heavy burden of work which seemed harder because much of it was so futile. C.C.W.